RECOVERY • Easter recovery wraps! Because it’s almost Easter and a busy time of the year with auditions and projects. A busy time in which it is extra important to take good care of your body. And what better way to do so than by eating the right foods at the right time? By eating the right nutrients, you ensure optimum recovery and therefore better performance the next day. So, for this first recipe post: a simple but delicious recovery snack that is colorful, easily made and effective! 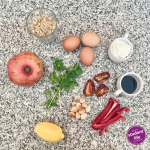 This recovery wrap is packed with vitamins, minerals, but especially proteins for that optimal recovery after a busy day, lessons and / or audition. 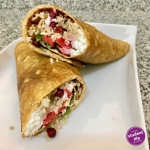 It is best to consume and enjoy a protein rich snack like this wrap within 30 minutes after you’ve finished your workout/audition/exercise. Why? Because your muscles are still well supplied by a quickened blood flow which assures the amino acids (from which a protein is build) quickly reach the right place in your muscles and body! Whisk up the eggs and the egg white together with the ketjap manis, in a bowl. Heat 1 teaspoon of olive oil in a good non-sticking frying pan, on a high flame. Turn down the flame and pour the egg mixture into the pan. Slowly bake the egg wrap on a low flame. Flip it over when it’s firm enough and bake the other side for a bit. 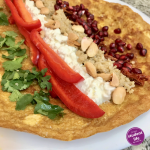 Cover the egg wrap with a row of coriander, sweet pepper, hüttenkäse, quinoa, almonds, and the pomegranate seeds. Sprinkle with lemon juice, and optionally add a pinch of pepper. Pull one end of the egg wrap over the ingredients and pull it tight enough to make the filling fit well within the wrap and then carefully roll the wrap. Either eat it right away or wrap it in tinfoil to go. If you happen not to like coriander, then use fresh flat-leaved parsley or chives. Whereas carbohydrates and fats are fuel for our bodies, proteins are not used for energy. Proteins are the building blocks of our bodies. Muscles, cells, hair, DNA and many other parts of the body are built from proteins. Proteins can serve as fuel too but the body prefers to use carbon hydrates or fat for that, because in order to use protein as fuel it has to be broken down first somewhere else in the body. This means extra work and is a waste of protein. Only if it’s really necessary, for example when there are no more carbon hydrates available, will the body burn protein for energy. Proteins are made up of amino acids, the building blocks the body needs. There are 22 types of amino acids, allowing the body to make hundreds of thousands of combinations: something different for all functions in the body. Nine out of these 22 amino acids cannot be produced by the body itself. These are the essential proteins that we get from our food, just as the unsaturated fat. Muscles are therefore also made of protein. When training your muscles, you have to make sure that there are enough proteins in what you eat. It’s the only way to make sure that there are sufficient ‘blocks’ to make your muscles grow and help them recover. Fat and proteins are important nutrients but it can take up to five hours before they are past your stomach. All the time they happily slosh and bounce along while you are exercising. That is a recipe for nausea. It is therefore better to avoid fat and protein shortly before and during exercising. Proteins are post-exercise food! Not really… Proteins are important for building up muscles, but your body can use only 2 g of protein per kilo bodyweight to do that. All proteins that your body can’t use to grow muscles or provide energy are converted into fat. So, more is certainly not always better! Did you perform at night or follow a particularly hard class? Then take a late-night snack with slow proteins, for example a bowl of cream cheese with a spoonful of honey, jam, or a few slices of banana. Now your muscles can continue to recover while you are sound asleep.